Combustion air is required for all types of fuel burning appliances in our homes to properly burn that fuel. The most popular fuel used in our homes is of course natural gas. For every one cubic foot of gas, there are 10 cubic feet of combustion air needed for clean burning in addition to dilution and ventilation air. There are two products out of a perfectly balanced gas combustion – carbon dioxide and water vapor, which are perfectly safe. However, if we limit the amount of the combustion air in the process, a third bi-product might develop, unfortunately a deadly one – Carbon Monoxide. Imagine a gas water heater in a small closet, behind the solid door, and without any openings in walls providing that necessary combustion air. After using all of the closet’s combustion air for burning process, the air pressure in the closet will become lower than the one inside the water heater’s vent flue pipe. The areas designated for fuel burning appliances are described as confined space and un-confined space. 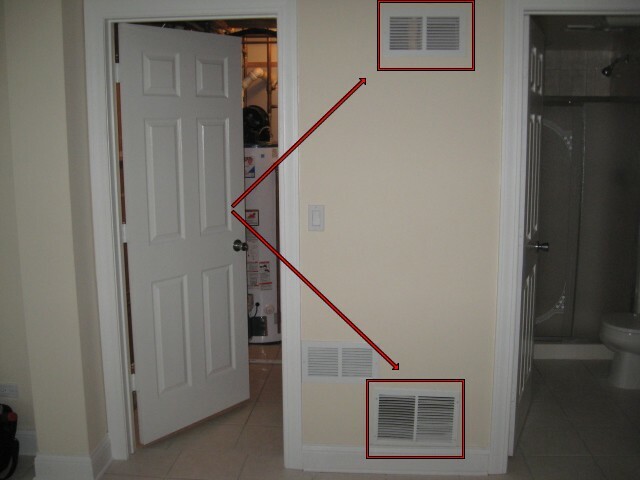 The water heater closet from my example could be a confined space – an area with a closed, solid door and walls / ceiling that create a barrier between the appliance and the rest of the house, thus not allowing any combustion air penetration. A confined space is a room that has less than 50 cubic ft of air volume for every 1000 BTU/hr of appliance input . 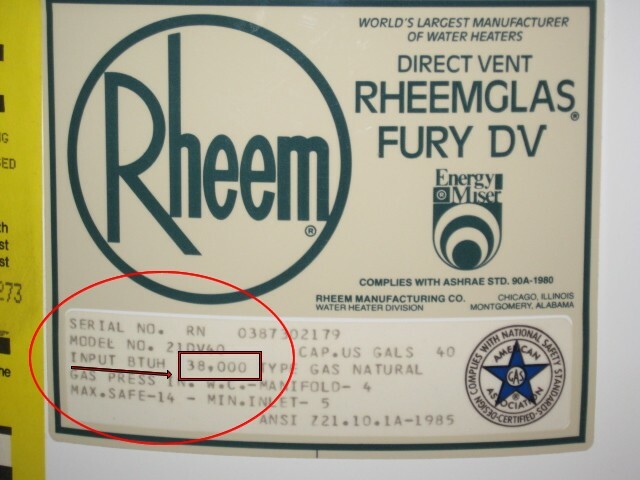 If the water heater has a 40 000 BTU/hr rating, the room would have to have over 2000 cubic feet of volume to provide enough combustion air (without additional sources) for proper burning process. Un-confined space is a room that has more than 50 cubic ft of air volume for every 1000 BTU/hr of appliance input (BTU/hr input should be on the appliance label / information tag). Assuming that our example water heater closet itself is a confined space, and it is located in a room being an un-confined space, we would require two openings in the closet door or wall to allow combustion air inside. One opening should be located within 12” from the floor, and second within 12” from the ceiling of the enclosure. Openings between confined space and unconfined space must have at least 100 sq. inch area each and provide at least 1sq. inch of a free airflow area per 1000 BTU/hr of the appliance input (1/4” min. or larger mesh screen if installed over the openings, metal grills and louvers provide 60%-75% of their net free area, wood louvers only 20%-25%). With a 40000 BTU/hr water heater input, the combustion process would require only 40 sq. inches of an opening at top and bottom, but you still have to obey the minimum 100 sq. inches per each opening requirement. Click for house interior combustion air calculations.